Get heavy, get loud–this is metal at its finest! 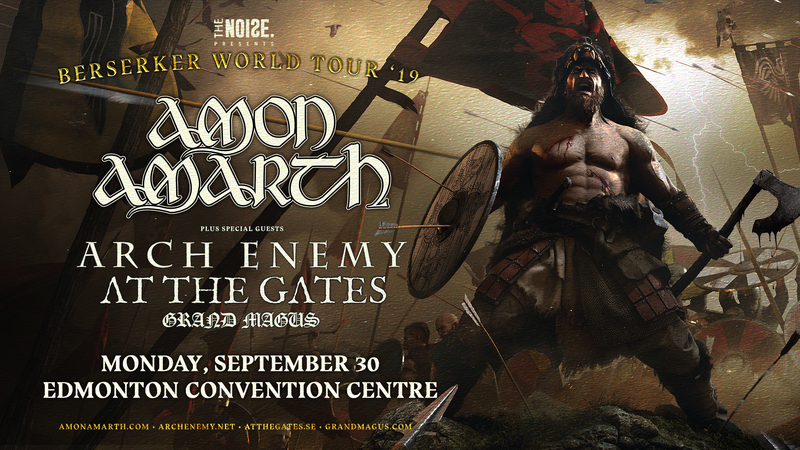 Experience Amon Amarth – Berserker Tour with guests Arch Enemy, At The Gates, and Grand Magus on September 30 at Edmonton’s convention centre. Swedish melodic death metal band Amon Amarth has a reputation that’s worth its weight in gold. As a powerhouse in the death metal world, their lyrics tribute Viking mythology and history. Formed in 1992, the Stockholm natives took their name from the Sindarin name of Mount Doom, a volcano in J.R.R. Tolkien’s Middle-earth. The band is composed of lead guitarist Olavi Mikkonen, vocalist Johan Hegg, bassist Ted Lundström, rhythm guitarist Johan Söderberg and drummer Jocke Wallgren. With ten studio albums, one compilation album, an EP and one video album, Amon Amarth will release their 11th full-length album, Berserker, on May 3. Berserker is the result of the huge surge of creativity. Arch Enemy, formed in Sweden in the mid-90s, is one of the most explosive and proficient modern metal bands. Accuring a huge global fan base, their music has reached pure metal supremacy with technical excellence, songwriting genius and irresistible live performances. At the Gates is a Swedish death metal band from Gothenburg, and a major progenitor of Gothenburg-style melodic death metal. Grand Magus is a three-piece heavy metal band from Stockholm. Grand Magus’ sound consists of an amalgamation of blues, hard rock, heavy metal and doom.